Douglas County Sheriff John Hanlin listens to a reporters question during a news conference Friday, Oct. 2, 2015, in Roseburg, Ore., concerning the deadly shooting at Umpqua Community College. Armed with multiple guns, Chris Harper Mercer, 26, walked in a classroom at the community college the day before and opened fire, killing several and wounding several others. 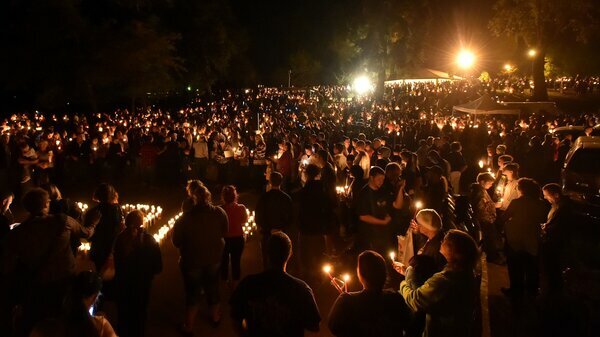 A vigil was held in Roseburg, Ore., last night, hours after a man killed nine people at the local community college. Investigators say the man behind Thursday&apos;s shooting is also dead — but the local sheriff also says he&apos;ll never say the man&apos;s name in public. Seven people were wounded in the attack. "I will not give him the credit he probably sought, prior to this horrific and cowardly act," Sheriff John Hanlin said in a briefing about the shooting at Umpqua Community College. Hanlin later told CNN that he doesn&apos;t want "to glorify his name or his cause." But at last night&apos;s vigil, Douglas County Commissioner Chris Boice told the crowd not to give the gunman any attention, as Northwest News Network&apos;s Chris Lehman reports for today&apos;s Morning Edition. "I challenge you all to never utter his name," Boice said. "This is about the families, this is about the victims, this is about our community, and this is about the tragic loss that we all suffered today. This is not about the shooter." The names of those slain have not been released; that announcement is expected sometime Friday. The attack occurred in mid-morning on the fourth day of classes in Umpqua Community College&apos;s fall semester. The gunman opened fire in a classroom. He was reportedly armed with several weapons and was wearing body armor. One survivor of the attack says the gunman tried to coax students out of a locked classroom. According to another account, the gunman asked his victims about their religion. Student Sarah Cobb, 17, was in her Writing 121 class when she heard a loud noise, looked out the window — and saw people running. She then realized gunshots were ringing out from the next door classroom — and she ran, too. "My parents have always told me: stay alert, be aware of your surroundings," Cobb says. "Once that noise happened, I looked around to see what&apos;s going on, and that&apos;s probably what saved my life." NPR&apos;s Tom Goldman reports that the father of a young woman who was wounded (and who is apparently OK after surgery) "said the shooter asked people if they were Christian. And then if they said yes, he said good, because you&apos;re going to see God in about a second." Hannah Miles, 19, tells the AP that she was also in the writing class — and that after they locked the classroom door, she and her classmates heard a man walk to the door and say, "Come on out, come on out." The students didn&apos;t open the door until later, when they were convinced the police were outside. Freshman Evan Hocker tells Northwest News&apos; Lehman, "I heard gunshots and then someone, one of my teachers, said there was a shooting, and then we all just went into a closet with a group of people and locked the whole place down." Hocker, who&apos;s studying computer science, says the violence was shocking, particularly in Roseburg, where "nothing really bad happens at all. Everything&apos;s small and everything&apos;s perfectly fine, usually." The college&apos;s interim president, Rita Cavin, said, "Our hearts and prayers go out to the families, and to the staff and students who witnessed this atrocity. This is a real crisis situation." Roseburg is about three hours&apos; drive south of Portland, west of the Deschutes National Forest. Discussing the community, Tom Goldman says the area is coping with a sharp decline in the local timber industry. "Douglas County has one of the higher unemployment rates in the state," Tom says. "And this is the importance of Umpqua Community College – it&apos;s the only college in Roseburg and the county. The average student age is the late 30s, and this is where many go to reinvent themselves and find new careers."